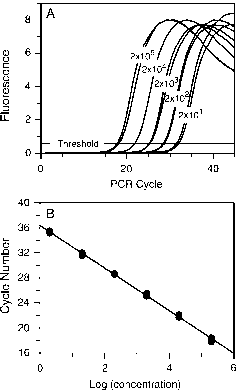 where the parameter E is the PCR efficiency, ideally equal to unity, and Ct(1) is the threshold cycle value where one copy of the standard would appear. Assuming that the standard curve parameters also apply to the clinical samples, the concentration of the clinical samples can be determined from the measured Ct values. DNA-based sequence recognizing fluorescent probes commonly utilize a fluorophor/quencher pair that is, in some manner, separated in the course of the amplification reaction. TaqMan® probes, for example, are degraded by the 5'-nuclease activity of the DNA polymerase, which releases the fluorophore from its sequence-recognizing element, and thereby separates it from the quencher, so that a light signal is emitted upon excitation. Molecular beacons achieve the same goal by a rearrangement of the secondary structure upon hybridization, which causes a separation of the quencher and the fluorophore. Fluorescence resonance energy transfer (FRET) probes work slightly differently. Instead of the acceptor dye functioning as a quencher, it emits the detectable fluorescence when the two probes bind adjacent to each other on the target DNA molecule. The LightUp® Probe (Fig. 1) represents a significant departure from this paradigm, because the DNA has been entirely replaced by the homomorphous but uncharged and achiral DNA analog PNA (Fig. 2). Peptide nucleic acid is composed of N-(2-aminoethyl)glycine subunits and forms very stable hybrid complexes with both DNA and RNA with a sequence specificity that is higher than that DNA has for itself. An asymmetric cyanine dye, such as a thiazole orange derivative or 4-[(3-methyl-6-(benzothiazol-2-yl)-2,3-dihydro-(benzo-1,3-thiazole)-2-methylidene)]-1-methyl-pyridinium iodide (BEBO), is generally used as the fluorescent marker (Fig. 1). This type of dye releases excitation energy by internal motion when it is free in solution and is, under these conditions, virtually nonfluorescent. When bound to DNA, however, the dye becomes brightly fluorescent. [10-13] Because the dye is positively charged, a significantly higher background signal would result from internal binding of the dye if DNA is used instead of PNA. Fig. 1 A schematic view of the LightUp Probe. The dye may be different. Fig. 2 The homomorphous DNA and PNA subunits. several instrument platforms use a single wavelength excitation source (e.g., the ABI real-time PCR instruments and the Roche LightCycler), it is necessary to design asymmetric cyanine dyes with greatly varying Stokes' shift, which may prove difficult, to enable multiplex detection with LightUp Probes. However, the trend is that new real-time PCR instrumentation provides several excitation wavelengths (e.g., the Rotor-GeneTM from Corbett Research, the SmartCycler1 from Cepheid Research and the iCycler from Bio-Rad). Figure 3A shows the real-time amplification curves, in duplicates, for a successive dilution of an Epstein-Barr virus (EBV) DNA solution, obtained by using the LightUp ReSSQ EBV Assay. The initial EBV template concentration ranges from 20 to 200,000 genome copies, as indicated. Prominent Hook effects are observed at all concentrations and the end signal is independent of the initial template amount. This shows that the probe is stable throughout the PCR run. With DNA probes, the end signal commonly decreases for low template concentrations, which is likely to be an effect of probe degradation. By fitting a standard curve to the threshold cycle numbers in Fig. 3A and the logarithm of the known concentrations (Fig. 3B), it is found that the PCR efficiency is 96% and that the Ct(1) value is 36.4 cycles. Fig. 3 The LightUp ReSSQ Epstein-Barr virus assay. The viral load of an unknown clinical sample could easily be determined from its Ct value and this standard curve. As an example, a clinical evaluation study shows that quantification with the LightUp Cytomegalovirus (CMV) ReSSQ Assay is very similar to that of the Roche COBAS Amplicor CMV Monitor, but with higher sensitivity (to be published). Applications of LightUp Probes also include bacterial DNA diagnostics. One example is Salmonella typing. It has been shown that the Salmonella bongori serotype could readily be distinguished from the Salmonella enter-tidis and Salmonella anatum serotypes from a single mismatch in the probe target region. In another study, Yersinia enterocolitica was quantified over four log units. LightUp probes have also found application in cancer diagnostics. The relative expression of the immunoglobulin k and l genes is a sensitive marker for non-Hodgkin B-cell lymphomas. In a healthy individual, 60% of the B-cells produce k chains, while the rest produce l chains. A significant perturbation of this ratio is indicative of B-cell lymphoma. In a recently published study, 28 of 32 clinical samples were correctly diagnosed B-cell lymphoma by cDNA quantification using LightUp Probes.